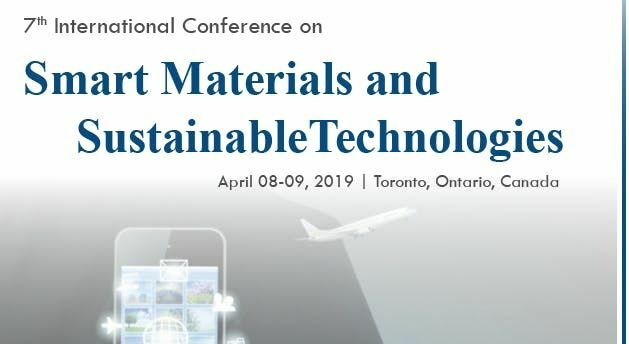 Smart Materials 2019We are pleased to announce the 7th International Conference on Smart Materials and Sustainable Technologies during April 11-12, 2019 at Toronto, Ontario, Canada with the theme “Insight towards Novel Research on Sustainable Advancement”. It takes the honor to invite participants like OCM, speakers, delegates, exhibitors from all over the world for its best conference. 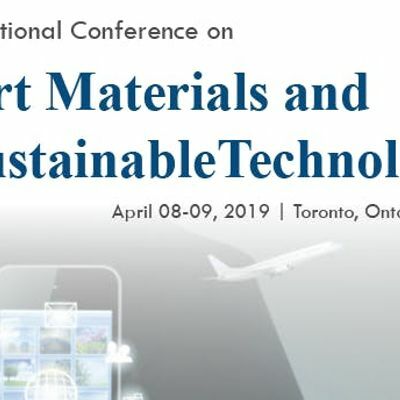 Smart Materials 2019 serves new ideas and new technologies among professionals, students for sharing their new innovations.Why to Attend Smart Materials 2019?Smart Materials 2019 conference aims to bring together leading academic scientists, researchers, and research scholars to exchange and share their experiences and research results. It also provides a premier interdisciplinary platform for researchers, practitioners, and educators to present and discuss the most recent innovations, trends, concerns as well as practical challenges encountered and the solutions adopted.Disciplines Related to Smart Materials and Sustainable Technologies:> Materials Science > Nano Technology > Mechanical Engineering > Electrical and Electronics Engineering > Civil and Architecture > Chemical Engineering > Environmental Science Why Toronto, Ontario, Canada?Toronto is the most populous city in Canada and the provincial capital of Ontario . It is located in Southern Ontario on the northwestern shore of Lake Ontario. Toronto's unmatched diversity shines through in its countless arts and entertainment opportunities. As the nation's cultural heartland, Toronto hosts international audiences at a wide variety of arts and sporting events in world-class facilities. Toronto­ is the leading tourism destination in Canada , attracting­ more than 25 million Canadian, American and international visitors annually. Toronto is a clean, safe cosmopolitan city with a wonderful network of parks, recreational, and cultural facilities. Toronto is the home of four professional sports teams and the third largest English-speaking theatre district in the world, behind New York and London. One of the world’s most ethnically diverse cities, it is home to more than 80 ethnic communities from Africa, Asia, and Europe. Toronto is also the business center of Canada. An alpha global city, Toronto is an international center of business, finance, arts, and culture, and is widely recognized as one of the most multicultural and cosmopolitan cities in the world. Toronto is the fourth largest city and fifth largest urban agglomeration in North America. Toronto is a center of business, finance, arts, and culture, and is recognized as one of the most multicultural and cosmopolitan cities in the world. Sessions / TracksTrack – 1 : Smart Materials and TechnologiesSmart Materials also referred to as hybrid materials are composed of dissimilar phases which change significantly whenever external stimuli are applied such as temperature, stress, magnetic or electric fields. Smart Materials are combinations of at least two different materials, which allow the engineering of desired properties in the newly combined hybrid. Proper modelling, simulation and control help in integrated system design of smart materials. Piezoelectric and Ferroelectric materials produce electric current when they are placed under mechanical stress. Due to their fast electromechanical response and their low power requirement, piezoelectric materials are widely used in the structural control applications. Electroluminescent materials are semiconductors which allow exit of the light through it. Shape-memory alloys have the ability to return to their original shape when heated in the deformed condition.Track – 2 : Smart StructuresSmart Structures offer the ability to match the conditions for more than one optimum state thereby extending functionality. Smart Structures are capable of sensing stimuli, responding to it, and reverting to its original state after the stimuli is removed. Smart structures can resist natural calamities. Many well-defined structures such as metals, ceramics or polymers cannot satisfy all technological demands. Therefore, there is a constant search for new materials having new, and especially improved properties. Such properties are observed in, composite materials which are defined as materials composed of at least two phases.Track – 3 : Sustainable TechnologiesSustainable technology relies on resources that are either renewable or so abundant that we can treat them as such. For technology to be sustainable also means that using it does not have any long-term adverse impact on the environment. Track – 4 : Nanomaterials, Nanotechnology and SensorsNano Materials are designed materials with advanced benefits in various fields of science, available in variable modes. These materials weigh light but sound hard in the material science subject. Nano materials are smart materials with definite designed structures. Nano devices, the quickest moving segment in the general market, the Nanotech research involves smart sensors and smart delivery systems, magnetic Nano devices, Nano-biosensors, Nano switches, optical biosensors, and other biologically inspired devices. The 21st century has seen the introduction of applications of Nanotechnology in commercial products, although most applications are congested to the bulk use of passive Nano materials. Examples include titanium dioxide and zinc oxide nanoparticles in sunscreen, cosmetics and some of the food products; carbon nanotubes for stain-resistive textiles and cerium oxide as a fuel catalyst.Track – 5: Architecture and Civil EngineeringIn the construction industry, developmental projects usually require the knowledge and understanding of civil engineering and architecture. These are important disciplines that deal with the process of creating structures, such as buildings, airports, churches, houses etc. Both Civil Engineering and Architecture are involved in planning and designing structures. However, architecture focuses more on the spatial functionality and aesthetics of the developmental work and is more concerned with the artistry, look, feel and functionality of the design, while Civil Engineering concentrates on the structural elements of the design, making certain that the structure can endure normal and extreme conditions.Track – 6 : Green ChemistryGreen chemistry, also called sustainable chemistry, is an area of chemistry and chemical engineering focused on the designing of products and processes that minimize the use and generation of hazardous substances. Whereas environmental chemistry focuses on the effects of polluting chemicals on nature, green chemistry focuses on the environmental impact of chemistry, including technological approaches to preventing pollution and reducing consumption of non-renewable resources. The overarching goals of green chemistry—namely, more resource-efficient and inherently safer design of molecules, materials, products, and processes—can be pursued in a wide range of contexts. Track – 7 : Optical and Electronic MaterialsOptical and Electronic smart materials are the materials which are associated with electricity. It incorporates the design, study and manufacture of smart materials that convert electrical signals into photon signals and vice versa. Any device that operates as an electrical-to-optical or optical-to-electrical is considered as an optoelectronic device. Optoelectronics is built based on the quantum mechanical effects of light on electronic materials, sometimes in the presence of electric fields, especially semiconductors. Optoelectronic technologies comprise of laser systems, remote sensing systems, fiber optic communications, optical information systems, and electric eyes medical diagnostic systems.Track – 8 : Smart Materials in Industrial ApplicationSmart materials got vast applications in Aerospace, Mass transit, Marine, Automotive, Computers and other electronic devices, Consumer goods applications, Civil engineering, Medical equipment applications, Rotating machinery applications. The health and beauty industry is also taking advantage of these innovations, which range from drug-releasing medical textiles, to fabric with moisturizer, perfume, and anti-aging properties. Many smart clothing, wearable technology, and wearable computing projects involve the use of e-textiles. Intelligent Structures of Architecture and Civil Engineering are been a subject to reveal and unlock the ancient and magnificent architecture by human on the redesigning the earth's geography. The research on archaeological technology of Structural engineering, advanced innovations in Civil Engineering, current applied principles of geotechnical, structural, environmental, transportation and construction engineering, sea defense systems against raising sea levels, under water-on water constructions, floating and green cities architecture, case study on Structural & Civil Engineering. Track – 9 : Environmental TechnologyEnvironmental technology is the application of one or more of environmental science, green chemistry, environmental monitoring and electronic devices to monitor, model and conserve the natural environment and resources, and to curb the negative impacts of human involvement. The term is also used to describe sustainable energy generation technologies such as photo voltaics, wind turbines, bioreactors, etc. Sustainable development is the core of environmental technologies. The term environmental technologies is also used to describe a class of electronic devices that can promote sustainable management of resources. Track – 10 : Smart Biomaterials and Medical DevicesAs Biomaterials are mainly used for tissue growth and delivery of drugs, similarly, their properties are also having a great impact on cell growth and proliferation of tissues. Physical properties are like size, shape, surface, compartmentalization, etc. Biosensors are the analytical devices which can convert biological responses into electrical signals. Biomaterials have many medical applications such as cancer therapy, artificial ligaments and tendons, orthopaedic for joint replacements, bone plates, and ophthalmic applications in contact lenses, for wound healing in the form of surgical sutures, clips, nerve regeneration, in reproductive therapy as breast implants, etc. It is also having some non-medical applications such as to grow cells in culture, assay of blood proteins in laboratories, etc Track – 11 : Materials for Energy Conversion and Storage DevicesSolar energy has being derived from natural sources that doesn’t harm the behavioural and environmental factors. The energy which is taken from the sun is converted into solar energy (thermal or electrical) for further use. Fuel production is also done from solar energy with the help of high temperature. In energy storage, energy is capture which is produced at one time and is store for future use. A smart grid is a system which includes a diversity of operational and energy measures including renewable energy resources, smart meters, smart appliances and energy efficiency resources. Batteries such as Lithium batteries are used in various types of mobile devices, including communication equipment, computers, entertainment devices, power tools, toys, games, lighting and medical devices. Track – 12 : Advances in Sustainable TechnologiesSustainable technologies have come a long way in the past few decades, driven by environmental awareness and the rising costs of fossil fuels. The development of the industry and the intensive agriculture, which was necessary to supply food to an increasing global population, have caused a very serious damage to the environment in terms of starting to run out of resources and pollution. Among the environmental problems, pollution of water and soils and waste disposal are one of the most important. In this context, efforts in research and innovation have to lead toward a green economy through the development of new and sustainable technologies in the production process to achieve water efficiency, waste reuse, and reduction of pollutants in order to protect soil and water quality and to ensure the sustainable manage of resources. Track – 13 : Mechanics and Behaviour of Smart MaterialsStructural Health Monitoring is a system with which a non-intrusive, active damage evaluation mechanism is attached to each structural component to continuously monitor the integrity of the structure or damage signatures. Surface properties include surface tension, surface characterization, charge - charge interaction, etc. It can be produced by using various techniques such as etching, plasma functionalization, etc. Physical properties are like size, shape, surface, compartmentalization, etc. Mechanical properties include elastic modulus, hardness, fatigue, fracture toughness, etc. The electrical and magnetic phenomena alter the properties of materials for better prospective in manufacturing. Track - 14 : Materials Chemistry One of the most talked about areas of materials research over the last few years is materials chemistry. A look at the MRS Fall Meeting program reveals at least seven symposia which could be considered as those under the domain of materials chemistry and a number of more focused meetings are also taking place, such as the Inorganic Materials Conference in September in Versailles. However, there is a lot of debate about what materials chemistry actually is. There are some who say materials chemists are just chemists in search of funding similar to how the physics community leaned hungrily towards materials science in search of funding over the last decade. At the other end of the spectrum there are those that take a universal view and include solid-state chemistry, carbon science and even polymer science in their definition. Of course, the truth lies between these two extreme cases and there are various committees around the world, including the NSF in the USA, engaged in trying to pin the definition down.Track – 15: New Concepts and InnovationsNew Concepts and Innovations Without continuous technological innovation, further energy savings will become increasingly difficult to attain. While petrochemical producers have made huge progress in energy reduction, they have almost reached a physical limit where any further reduction would not be of the same proportions as that already achieved. To continue the momentum of energy savings, the petrochemical sector is focusing on creating products with enhanced performance which in turn reduce energy consumption during their lifetime. Such examples include: Insulation in construction; lightweight plastics used in cars and transportation; solar panels; wind mills and water purification systems among many others.